A part of the National Mall, the Tidal Basin comprises some of our nation's most renowned monuments and famed cherry trees. Rising sea levels and as much as $500 million in deferred maintenance threaten this 107-acre landscape. Join us in a three-year campaign to ensure the Tidal Basin is preserved for future generations. The National Mall Tidal Basin, a cherished part of "America's Front Yard," links its historic assets to the American ideal they collectively represent: freedom, democracy, and international cooperation. This complex cultural landscape features memorials to Thomas Jefferson, Martin Luther King, Jr., and Franklin Delano Roosevelt, as well as famous cherry trees that blossom each spring. 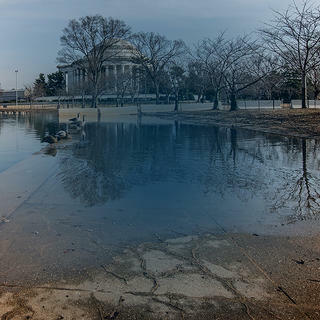 Due to rising sea levels, the silt and water of the Potomac Flats make the Tidal Basin unstable; the conditions they create compromise both historic resources and visitors' experiences. Each day at high tide, water floods the sidewalks surrounding the Tidal Basin, making them impassable and compromising the roots of the cherry trees. In addition, the daily flooding hampers accessibility, and perimeter and safety challenges, substandard visitor facilities, and inadequate interpretation all threaten the Tidal Basin. Chronic annual underfunding of the National Park Service maintenance budget compounds these issues. While we and our partners at the Trust for the National Mall are working together to address these challenges, you can show your support for the Tidal Basin—a National Treasure of the National Trust—and sign our pledge. Take Action: Save the Tidal Basin. Take the Pledge. Rising sea levels and deferred maintenance threaten this landscape. Join our campaign.